United Coffee Candy in 5.29oz (150g) bag. 50 individually wrapped in seal pouches. United Coffee Candies are crisp and densely rich. Sweet but with a robust and full sweet coffee flavor. United Candy coffee flavor has nice coffee taste and aroma. One of the best candy with coffee taste in the market. Excellent coffee candy, perfect for people in need of caffeine on the run. Contains Caffeine. Product of Thailand. Halal Certified حلال . 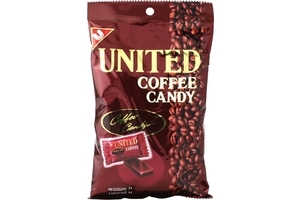 ◘ United Coffee Candy is made from Real Coffee extract. ◘ United Coffee Candy is made from High Quality Roasted Arabica Coffee Beans. ◘ Eating severals United Coffee candies might have the same effect of drinking a cup of premium coffee, perfect for people in need of caffeine on the run. ◘ United Coffee Candy is manufactured with advanced technology in a modern facilty. Awesome coffee taste. Best coffee candy by far. Imported from Thailand. 2 candies after lunch, keep me awake for the day. the best coffee candy on the market...entirely addictive! Calpis Calpico (White Peach Flavor) - 16.9fl oz. Wei-Chuan Mixed Fruit Juice (Jus De Fruits Melanges) - 12.32 fl oz.